I don’t know what it is about cheese, but I crave it almost daily. I had the opportunity a couple months ago to visit Heber Valley Cheese Farm with a few other food bloggers. We had the privilege of trying quite the variety of cheeses… and let me tell you, I was in heaven! These crackers are perfect because not only do they satisfy my cheese craving, but they are just the right size to pack up in your kid’s lunches, have for an after school snack or fulfill that salty craving you just can’t shake. You will be amazed at how easy they are to make and how quickly they whip up! I found this recipe at In the Kitchen with Kath and am so happy I did. This is definitely a recipe I will keep around and use often! Place shredded sharp cheddar cheese, butter, flour, salt and crushed red pepper flakes in a food processor. Pulse until the dough turns into coarse crumbs. Add milk and process until dough forms into a ball. Roll dough out onto a floured surface. Try your best to roll into a rectangular shape and until the dough reaches about ⅛" thickness. With a pizza cutter or knife, cut dough into 1" squares. Use flat end of a wooden skewer to poke a hole in center of squares. Place crackers on a greased baking sheet, at least ¼" apart from one another. Bake 12-15 minutes or until edges just start to brown. You don't want to over cook these. Store any not being eaten right away in an airtight container for 1-2 days. I made cheese crackers about 6 mos ago and didnt blog about them but couldnt believe how easy they were and love yours. Good reminder I need to make them again! Do you think it would still taste good with GF flour substitute?? My daughtere misses cheese crackers and I would love to find a substitute. I just made these for a the kids lunches, and I don't think they're going to last the night. Wow, they are delicious. I actually made my batch with whole wheat flour and coconut oil and they really turned out fantastic. Thanks for the recipe! Sorry for the silly question, but what did you substitute the coconut oil for? Butter? Thank you! 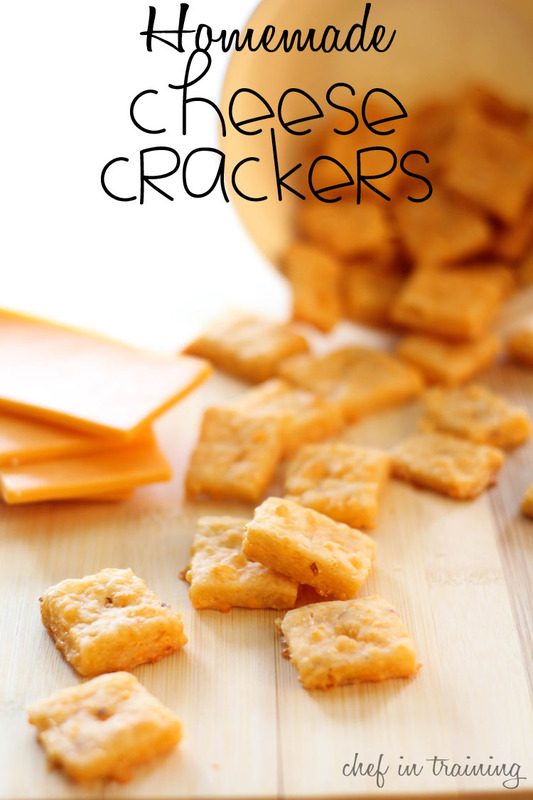 I have been wanting to make homemade cheese crackers for quite some time! I'm just going to have to do it I guess!! I made these and they were so yummy! We gobbled them right up. I suggest making a double batch if you actually want some the next day..
What the what? I totally need to make these! My family flips for Cheezits and these look way better and cuter! These look fantastic! I was hoping to make them today to bring on my girls' weekend power shopping trip. However, I only have a small food processor. Could they me mixed with a hand mixer or stand-up mixer? I think a stand up mixer would work well. I thought the dough was good...now I'm sorry I wasted it by not putting it in the oven! I see myself making these a lot this winter. They are absolutely delicious! Thanks so much for sharing! Holy Smokes... just took them out of the oven and they are fabulous. Might as well triple the recipe next time. I substituted some garlic powder and a pinch of cayenne for the red pepper flakes (I was worried the flakes would be too spicey and random). Hopefully there will be some left when my boys get home from school.... Thanks for sharing this recipe. Could you possibly use other cheeses as well in making these? Just wondering for variety! I think you could, you just might want to choose a harder cheese similar to cheddar, rather than a softer one such as mozzarella. I have made these, and I'm going to try parmesan next time! I didn't see a reply to the other person's question so that's why I'm asking.... I have a very small food processor that won't hold all of this, what would you suggest? I stopped buying Cheez its even though my family loves them, because they contain MSG. My son has a seizure disorder and his neurologist says they can be triggered by it. Finding nut-free healthy snacks to send to school has been hard (my girls' school is nut-free) so I really appreciate this! Just finished making these. OMG they are fantastic! I'm trying not to eat the whole first pan while the second is in the oven. Thank you! These were wonderful! They have a fresh cheese flavor, rather than that fake-ish after taste of cheesitz. I subbed black pepper and garlic for the crushed red pepper for my little ones and the flavor was perfect! Just made these for my 2yo with whole wheat flour instead or normal white one. Delish! I love your recipes and make them quite often. I would love to see nutrition facts put on them if possible. Thank you for sharing your love of homemade goods. These sound amazing. I love the super cheesey ones you can get at the store (you know the ones! ), but being able to make them at home seems so much better. Is it possible to freeze the dough? Can you freeze the baked crackers? Just in case I get the urge to make a big batch! Thank you! Its too bad these dont last longer, otherwise I would totally try to make them! They look so easy! Just made these today and no leftovers, so yes they are really that great! since I moved out of the u.s I have missed these, now no need too, Thank you for the recipe.